Bupropion is a pharmaceutical, prescription antidepressant which acts directly on the brain and other nerve cells. Bupropion is considered a 'second generation' or 'atypical' anti-depressant because its action is different from the previous generation of psychoactive medications. It was first introduced in the US in 1985 but was quickly withdrawn because of the high incidence of seizures, it was reintroduced in 1989 at a much lower prescription dose. It is generally found stimulating by users and reactions to it vary greatly, with some users experiencing panic attacks and other acute negative reactions to the drug. 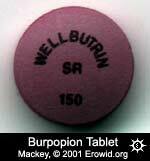 Bupropion is sold both as an antidepressant in the US under the trade name "Wellbutrin" and as an aid for quitting smoking under the trade name "Zyban". Bupropion hydrochloride is a white crystalline powder which is highly water soluble, has a bitter taste, and has a local anaethestic effect on oral mucosa (much like cocaine). Typicaly 75-300 mg daily with a maximum prescription of 450 mg daily approved by the FDA due to increasing risk of seizure with higher doses. Sold in pills of 75 & 100 mg and 100 & 150 mg time release. In Canada, sold as Zyban and Wellbutrin in 150mg and 300mg extended release tablets. $1-3 USD per daily dose in the United States and about $0.80 - $0.90 per pill in Canada ($CAN). Bupropion is not scheduled in the United States, but is legal for sale for human consumption only with a prescription or license. Most countries where bupropion is available, it is unscheduled, but requires a prescription to purchase. Bupropion is an aminoketone, chemicaly related to other phenethylamines, a class of molecule that contains a number of psychoactive chemicals. The exact mechanism of action of bupropion is not currently known. In rats, chronic stress leads to increased levels of tyrosine hydroxylase (a key enzyme in norepinephrine synthesis) in the locus coeruleus (LC). Chronic use of bupropion, as well as many antidepressants, shows decreased expression of tyrosine hydroxylase in the LC. Other known mechanisms of action of bupropion are that it is a weak inhibitor of neuronal norepinephrine, serotonin and dopamine uptake. Because its inhibition of serotonin reuptake is weak and because it also inhibits the re-uptake of norepinephrine and dopamine, bupropion is not generally classified as an SSRI. Bupropion selectively inhibits dopamine reuptake, much like cocaine, but, arguably, without the reinforcing effects. It has been used to treat children with ADHD, but there is a high incidence of severe skin rashes when used in this manner. It has also been effective in the treatment of smoking cessation (under the trade name Zyban). Unlike many antidepressants, Bupropion is not used to treat panic attacks, however, patients who have suffered sexual dysfunction as a result of serotonin-specific reuptake inhibitors may show some improvement if switched to bupropion. Its ability to treat cocaine addiction appears promising, though controversial. Bupropion is not an MAOI. First developed in the late 1970's it was first approved for sale in the United States in 1985 but quickly removed from the market in 1986 due to problems with seizures in patients. In 1989, Bupropion was placed back on the market in the United States at a lower recommended dose. Wellbutrin (Anti-depressant); Zyban (Nicotine addiction treatment). Bupropion appears to resemble behavioral stimulants more than it resembles antidepressants. Effects can include anxiety, restlessness, tremor and insomnia. Some users have reported that it can alleviate cravings for amphetamines and has been used to replace amphetamine in some cases of depression and ADHD. Acute effects can generally be felt within 60-90 minutes of administration, but long term antidepressant effects may take days or weeks to develop. Users report that stimulation can last for 12-24 hours or longer after a single dose, active metabolites have half-lives of 20-34 hours. Restlessness, insomnia, anxiety reactions, discomfort, unpleasant stimulation, dry mouth, dizzyness / nausea, headaches, tremors. There is a very serious, though not common, possibility of seizures associated with bupropion. It may induce de novo seizures, meaning that even someone with no history of seizures -- family or otherwise -- may respond to bupropion in this way, especially at higher doses. This seizure incidence exceeds that of other marketed antidepressants. Immediate release formulas (not SR, sustained release) appear to promote higher risk of seizures. In addition, patients who have or have had anorexia nervosa or bulimia are at a higher risk of seizures. To reduce risk of seizures, the total daily dose should not exceed 400 mg/day, and any individual dose should not exceed 200 mg.
Bupropion may be dangerous in combination with MAO inhibitors and at least 14 days should elapse after the last dose of an MAOI is taken and the use of bupropion. Some users have reported unpleasant effects when taking psychedelics with daily doses of bupropion but other regular bupropion users have reported no adverse side effects when combined with LSD, Psilocybin Mushrooms, etc. Combinations of strong psychoactives may increase the health risks. Bupropion should not be taken by those who have been taking MAO inhibitors!! At least 14 days should elapse between the use of MAO inhibitors and the use of bupropion. Abrupt cessation of chronic administration of buproprion is not advised and slow tapering off is recommended, as with all chronically administered anti-depressants.